Mish's Global Economic Trend Analysis: Fed Yap vs. Futures; Bloomberg vs. CME; Eighth-Point Baby Hikes! 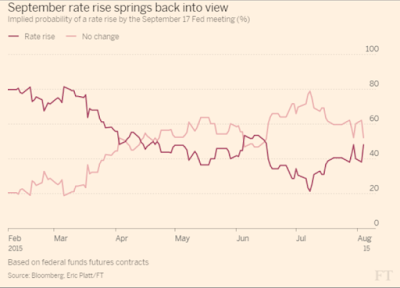 The Financial Times reports September Rate Rise Odds Improve as Lockhart Speaks. Expectations that the Federal Reserve will lift interest rates in September popped on Tuesday after Dennis Lockhart, president of the Atlanta Fed, said there would need to be a "significant deterioration" in economic activity to prevent the central bank from moving after its next monetary policy meeting. Federal funds futures imply a 48 per cent probability that the Fed will lift rates in September, up from just 38 per cent on Monday, according to data and calculations from Bloomberg. 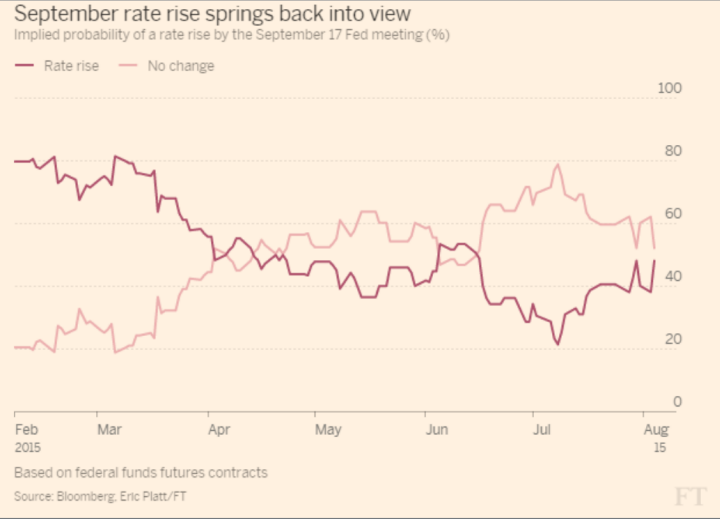 The same calculations imply that a move will have already taken place by October, while federal funds futures signal a 28 per cent likelihood that the central bank will have lifted rates twice by December (up from 21 per cent on Monday). Note that 80% odds in February are still under 50% today, according to Bloomberg's calculation. On July 21, USA Today reported Odds of Fed Rate Hike in September are Rising. St. Louis Fed chief James Bullard told FOXBusiness news on Monday there’s “more than a 50% probability right now.” that Fed policymakers will boost the central bank’s benchmark rate at a September 16-17 meeting. And 82% of 70 economists surveyed by the Wall Street Journal said last week they expect the Fed to act in September. It would be its first rate increase in nearly a decade. This Fed-Yap has a clear purpose: To get the market to expect, even front-run a hike. After all, the Fed does not want to surprise the market in any way shape or form. In contrast to the 48% chance noted by Bloomberg, CME's Fed Watch Probability says there's a 0% chance of a hike. A moment ago the CME stated there was a 2% change. It's now back to 0%. Yesterday it was 12%. What's going on? I suspect the answer can be found in the following bullet points on the CME site. FOMC meetings are matched with the corresponding 30-Day Fed Funds Futures contract. Probabilities of possible Fed Funds Target Rates are calculated based on the post-meeting Fed Fund Futures contract price. Probability of Rate Hike is calculated by adding the probabilities of all target rate levels of 0.50 or higher. The key point is the last one. The current range is 0 to 0.25%. If the Fed were to hike to a flat .25%, a baby first step, it appears the CME tool may not call that a "hike". My assumption seems correct as per a phone conversation with a managing director of fixed income at Raymond James with whom I was discussing the above charts. I just got off the phone with a contact at Bloomberg. They actually used to do it the way the CME is doing it. They received so many calls, they looked into it, and decided to make a change. Basically they are calculating the probabilities of all points within the range, rather than just probabilities of 0 and 25,or 25 and 50. This makes sense because futures rarely trade right at those rates. Right now it’s at 13 basis points. And given futures are a “market”, the 50/50 more or less would make sense because that’s what I gather from all the people I read or get funneled through financial media. Zero percentage change next meeting simply makes no sense at all. Confusing for sure, but pretty sure Bloomberg has this right. The current Futures price is 99.81. The implied interest rate is 0.19%. The Fed Funds Future currently sits at 0.13%. Note that 0.19% just happens to be the precise mid-point between 0.13% and 0.25%, with Bloomberg eying a roughly 50% chance of a hike. Will the first hike be to a flat 0.25%? Up from 0.13% that would be a hike of 1/8 point. In the October or December meeting, the Fed could easily hike another eighth, or it could alternate between small ranges and fixed numbers.